MLB rookie Stephen Strasburg underwent an MRI last week, and the results are not good. Strasburg has a tear in his ulner collateral ligament in his right elbow, which means he will most likely have to have Tommy John surgery. Undergoing the surgery would mean the most hyped rookie in MLB history would miss the 2011 season. Tommy John surgery is named after the first professional athlete to undergo the surgery and make it back to the majors. 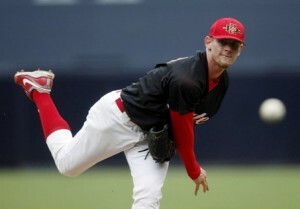 Thejerseychaser.com hopes Strasburg finds the same luck. Stephen Strasburg injuried, season over? The most highly anticipated rookie in baseball history is facing a possible season ending injury. Stephen Strasburg left the fifth inning of Saturday’s Washington Nationals’ game against the Philadelphia Phillies with a strained flexor tendon in his right forearm. He will undergo an MRI to see the severity of the injury. The 22-year old has lived up to his hype with a 2.91 ERA and 92 strikeouts in 68 innings. Currently, the Nationals are in last place in the NL East and are 17 games out from 500. 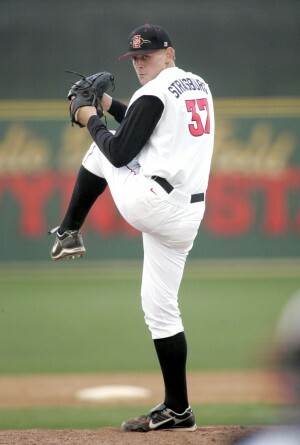 2009 MLB first round draft pick,Stephen Strasburg is set to make his major league debut tonight as the Washington Nationals play the Pittsburgh Pirates. Strasburg signed with the Nationals for a record $15.1 m 77 seconds before the contract deadline. 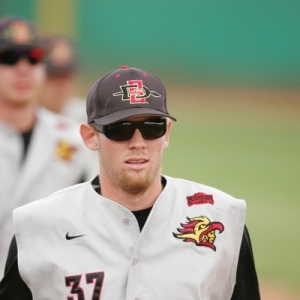 Strasburg had an impressive college career at San Diego State where he played two seasons, including one no-hitter, before being drafted in the first overall by the Nats. Strasburg pitched 9 innings and allowed three hits during Spring Training for the Nationals. This season, Strasburg has spent in the minors going 7-2 with a 1.30 ERA, 65 strikeouts and only 13 walks in 55 1-3 innings. Strasburg has impressed the Nationals enough that he will make his major league debt tonight at 7:05pm. How big is tonight’s game? For starters, 200 media credential passes were requested and the game is expected to gross more than $1.5 million for the Nationals. Stephen James Strasburg (pronounced /ˈstrɑːzbərɡ/; born July 20, 1988 in San Diego, California) is a right-handed pitcher for the Washington Nationals, who selected him with the first pick in the 2009 Major League Baseball Draft. He signed a record $15.1 million contract with the Nationals on August 17, 2009, just 77 seconds before the deadline, breaking a record previously held by Mark Prior, who had signed for $10.5 million in 2001. He was called the “most-hyped pick in draft history” by ESPN and the “most hyped and closely watched pitching prospect in the history of baseball” by Sports Illustrated.